Kirtan is the science of Sikh Devotional Singing, having its roots in Punjab, Northern India. It is based upon ancient Indian music, more commonly referred to as Hindustani Classical Music. The foundations of both the instrumental and vocal music lie in structured melodies or ‘scales’ called ‘Raags’. Although they are formed from the same 7 notes (Do, Ray, Me, etc) as Western music, there are many more semi-notes and also strict rules which govern the scale of each Raag. Each Raag belongs to a group or ‘family’ and they are related by their notes. Each family of Raags conveys a particular mood; be it happiness, love, separation, longing, sadness, etc. Raags can also express the season like the coming of Spring or the Rainy Season, and can be either sung or played with string instruments. The other essential accompaniment of Raags is ‘Taal’ or rhythm. Indian Classical music has a rich treasure of different cyclic rhythms or beats and tempos, for example, 12 beats Iktaal and 5 beats Surfakta. In order to sing Kirtan, the 3rd and most important component is required – this is known as the ‘Shabad’( literally the Divine Word). The Shabad is essentially taken from the Sikh Religious Canon, ‘Sri Guru Granth Sahib’ . Sikhism is a modern monotheistic religion having its origins in the 15th Century in Punjab, Northern India. It was founded by Guru Nanak Dev who used ‘Kirtan’ to convey is message of Divine Love and the Oneness of God and Humanity. He travelled to many countries including the Middle East, Sri Lanka, Russia and all over ancient India singing his message of love. He utilised the services of a Rebeck player who played Raags, whilst the Guru sang the Shabad. Together, they started the Sikh tradition of Kirtan which continued until the 5th Successor of the Guru, Arjan Dev who compiled the Shabads of the previous 4 Gurus and other saints into the Sri Guru Granth Sahib, whose 31 chapters are all categorised into Raags. The type of music perfomed for Kirtan during this period was known as ‘Drupad’ which traces its origins back to the Vedas (the Hindu’s holiest and oldest scripture). It has a very strict tempo utilising the pakhavaj or mridang (Classical Indian Drums) Indian, having a profound effect on the listener. This type of traditional singing evolved until the Tenth Guru, Gobind Singh who patronised kirtan and encouraged its practice as the primal form of worship. He also authored two further Granths which also utilised Raag and Taal, aswell as his Divine Shabads. During this period of Sikh history, the Khyal style of singing became popular in Northern India, as it placed less constraints on the melodies, as well as utilising the Tabla more as a rhythmic accompaniament. With the arrival of the British into India, the Harmonium became more prominent in Sikh Shrines eventually almost replacing the stringed instruments like the Taos, Dilruba and Saranda. Yet, the music retained its original compositions and rhythms. However, as the popularity of Bollywood Music grew towards the latter half of the 20th Centuary, Kirtan developed into a modern mix of old and new, thereby bringing this great musical and spiritual heritage under threat. Since the 1960s there has been an increasing interest in the West for spiritual traditions of India, where westerners have embraced sacred mantras from Hinduism, Buddhism and Sikhism. The vast majority have been chanted and sung to western tunes and instruments, thereby making the benefits of eastern spirituality and yoga easily accessible to millions of people. This is a massive market which has created a new genre of spiritual music and already produced hugely successful artists such as Deva Premal, Mirabai Ceiba, Snatam Kaur and Jai Gobind. There is a gap however, in this emerging market, of Spiritual Music based upon Indian Ragas or Classical Melodies. This has been the bases of Indian devotional music for millennia. Music is a universal language which has the power to bring people together. This concept was utilised by Guru Nanak, the first Sikh Guru who was a Master of Indian Classical Music. Together with his Sufi Rabab player, Bhai Mardana, he travelled the known world spreading his teaching of oneness over 500 hundred years ago. He was a pioneer in Interfaith and utilised popular Raga music of the day such as Dhrupad and Folk music called Vars upon which to sing poetry known as Gurbani, which later formed the chapters of the Sikh Scripture, Guru Granth Sahib. All world music is based upon 7 basic notes known in India as ‘Sa Re Ga Ma Pa Dha Ni’ and as ‘Do Re Mi Fa So La Ti’ in the West. Other similarities between Eastern and Western music includes Raga Durga which equates to the Pentatonic Scale in western music. This is a universal Raga and can be found in Celtic, Native American, Blues, African and Chinese music by changing the base note of ‘Do’ or ‘Sa’. The Blue Lions Band from the UK have been one of the latest emerging bands bridging the gap between East and West, and singing new innovative compositions encompassing Raga and Mantras and delving into fusion music. They travel around the world performing music in settings ranging from headlining the O2 Arena London with Basement Jaxx, performing with Bob Dylan, Terry Oldfield and Anna Phoebe, to teaching Raga Kirtan to street orphans in Uganda. Earlier this year they performed two sold out concerts at the Royal Albert Hall where they show-cased Indian Classical Music to audiences, the majority of whom, had never heard Indian Classical Music. The lead vocalists are Dr Kamalroop Singh and Ragi Harminder Singh, and their tabla players are Simran Singh and Virpal Singh Ghalley, who are advanced students of the legendary tabla player Ustad Tari Khan, the doyen of Panjab Gharana. Gabriel Icka M, is the latest member to join the band and is descended from the ancient people of Easter Island (Rapanui). IS THERE ANY FUNDING AVAILABLE FOR THIS EMERGING GENRE OF MUSIC? The Blue Lions and others are following in the footsteps of the great Guru Nanak and taking Raga Kirtan around the world, and have manged to secure £100,000 of funding from the Heritage Lottery Fund to preserve and digitally re-master recordings of ancient dhrupad compositions. Part of the project includes working closely with the Curator for World Music, Dr Janet Topp-Fargion of the British Library. This is will be the first time spiritual music of this genre will be deposited and available at the British Library. The group are also applying for a further grant from Arts Council England, to develop their music and bring more awareness of Indian Classical Music into the mainstream. HAVE THERE BEEN ANY INVOLVEMENT IN ANY CHARITY WORK? The Blue Lions have been working closely with Sandra Murphy who founded the UK based charity One-Step-At-A-Time, to bring Raga Kirtan to street orphans in Lira, Uganda. Dr Kamalroop Singh and Ragi Harminder Singh visited several schools and a remote village deep in the bush in 2015 to perform and teach Kirtan to these children. “When I witnessed the profound effect of singing Vaheguru mantar in Raga Desi to hundreds of these poor children, and then saw the delight and beaming smiles on their faces, I finally realised the true purpose of the devotional classical music!” said Ragi Harminder Singh. 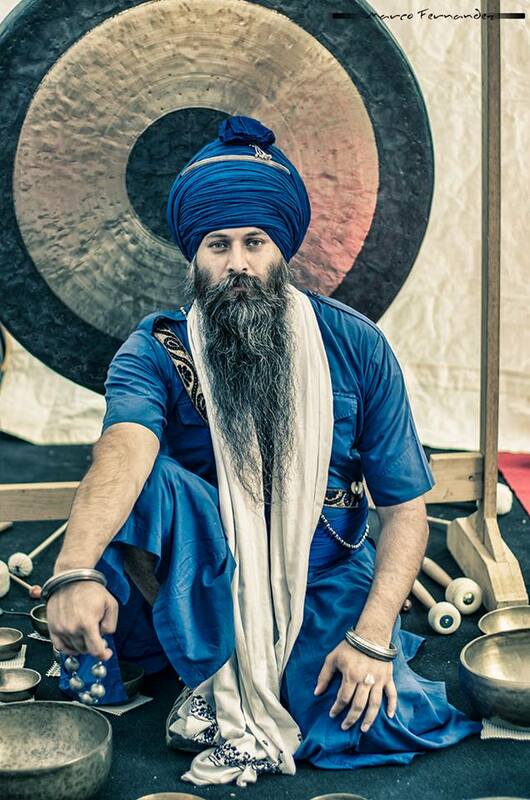 WE ASKED DR. KAMALROOP SINGH WHAT HE THOUGHT THE FUTURE OF SPIRITUAL MUSIC WAS? Dr Kamalroop Singh said “if we don’t bring this music out into the wider world and especially the mainstream, this rich musical heritage from the Panjab is in serious danger of dying out. Guru Nanak used the music of the day, which was Dhurpad and Folk music like Vars, so that common people could relate to the Shabad-Guru. We need to update this now, and utilise the common music of today’s world so we can share’s the Guru’s message in a form easily digestible. As well as preserving the music given by our Gurus, we are looking at Mantra compositions using trance/fusion music as well as bringing instruments like the digeridoo and working with Mexican Shamanic and Celtic music”.